Subject: Antique print, titled: 'Etats Unis, Revue du Regiment des Volontaires de New York passee par les ambassadeurs Chinois.' - United States. 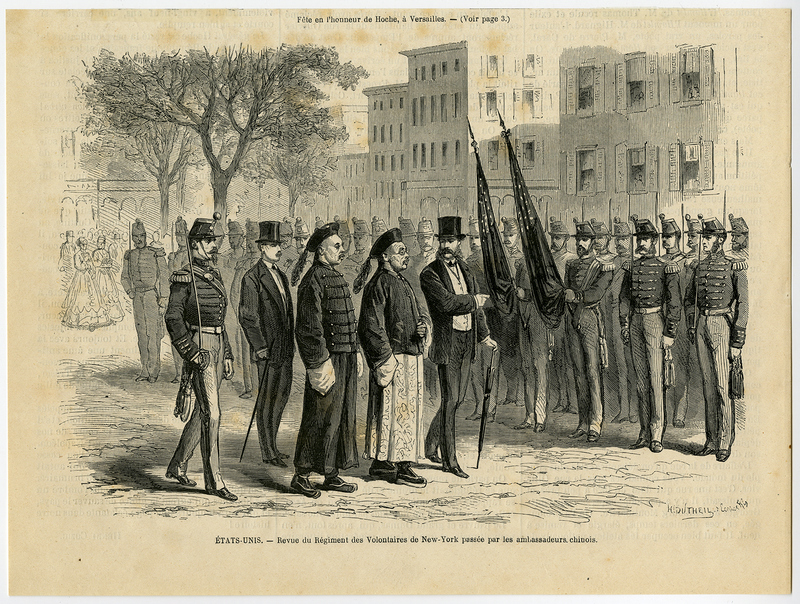 - Inspection of the Regiment of the New York Volunteers by the Chinese ambassadors. Condition: Very good, given age. Damp stain in the margin through the image. Text on the rear side. General age-related toning and/or occasional minor defects from handling. Please study scan carefully. Size (in cm): The overall size is ca. 25.3 x 18.9 cm. The image size is ca. 22.5 x 15.7 cm. Size (in inch): The overall size is ca. 10 x 7.4 inch. The image size is ca. 8.9 x 6.2 inch. Artists and Engravers: Made by an anonymous engraver after 'H. Dutheil'.